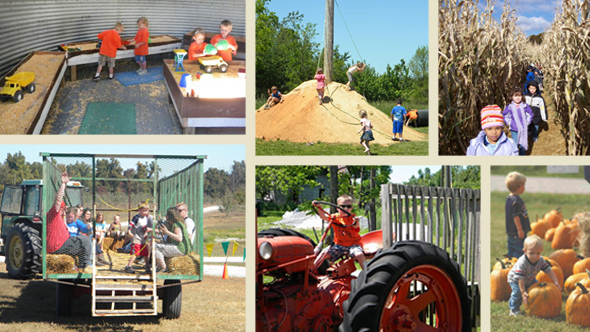 It is always a fun time to visit Hinton’s Orchard and our FarmLand play area. Many families think of us in the fall for pumpkins, apples, and hayrides but the fun continues in the spring and summer too! Take a hayride around the farm and through the orchard pulled by our tractor. In the fall, hayrides stop at one of our pumpkin patches. Our wagon keeps safety in mind with secure sides. Hayrides offered on all festival days, regularly on weekends in September & October, and by appointment at other times. Many farms have grain bins for storing corn and soybeans, but few have bins as fun as the one at Hinton’s Orchard! We’ve converted our grain bin into a corn box and farm toy play area! Kids love it! In addition to the tractors we use on the farm to grow our crops, we’ve got a tractor just for the kids! A Case SC was placed near the grain bin with steps and a safe platform for your little farmer to drive and tend the crops! Swing, slide or look out over the land in Jacob’s Barn. Made from the wood of an older barn on the property, this part of Hinton’s FarmLand is a hit with all of the kids. Other permanent features in Hinton’s FarmLand include Hinton’s Hill and the Mini-Market. The Mini-Market lets kids pick out their own (play) fruits & vegetables and even “cook” them! The corn maze covers 3 acres winding guests through more than 1 mile of trails. While finding your way through the corn, play along with our scavenger hunt to find informational stations throughout the maze. In season, take a hayride, or a short walk to one of our pumpkin patches. Hinton’s grows over 8 acres of pumpkins and nearly 70 different varieties. So, whether you pick or we pick the pumpkins, you are sure to find the perfect one! A straw pile, pedal tractors, and more are also included as part of our fall FarmLand activities. We hope to see you soon at Hinton’s Orchard & Farm Market!